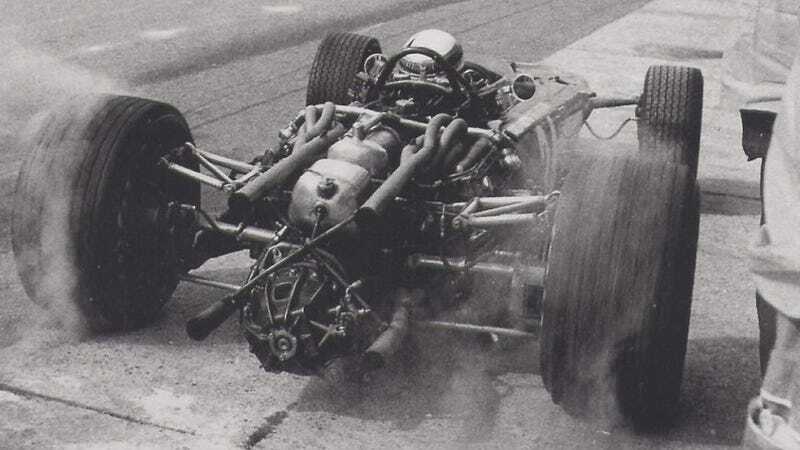 This is Jackie Stewart at Monza in 1966, kicking up dirt with the fat rear tires of his H16-engined BRM P83, an overweight mess of cylinders and piping, three months after the accident at Spa that changed his life and led him to begin his campaign for safety in Formula One. Had the photograph been taken from a higher angle, we could see the spanner Stewart had taken to taping to his steering wheel after the accident, suffered at the 1966 Belgian Grand Prix, where, after hitting a telephone pole, he sat soaked in fuel in his car for almost an hour until fellow racers Graham Hill and Bob Bondurant managed to remove him using a toolkit borrowed from a spectator. It was a very wet race, with only 5 out of 18 cars still running at the end, and it is also a race you have seen: the Spa-Francorchamps scene in John Frankenheimer’s Grand Prix was filmed at the event.